A good idea to wear long pants today as the railway line can be a bit overgrown in parts. This is quite a short day but not the easiest. Head eastwards along Sutton Road and turn left at Racecourse Road it will turn into Morris Road. This will run along the railway line. After that it turns into a track and continues on for another few kms before coming to a halt. After that you have to walk along the railway line. It can be a bit difficult at times as it a bit overgrown. This will continue for about 15kms. Occasionally there is a track to walk along but mostly it is on the railway line. 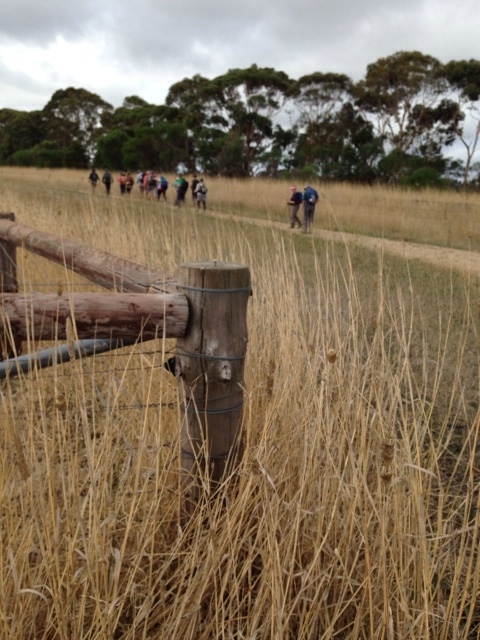 With about 5kms to go we got off the railway line and walked along a farm track on the left of the railway line. Walk past the Power station to Millers lane and turn left. Walk 650m and turn right into Campbell’s Road. 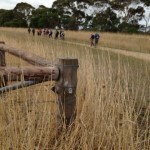 This eventually comes out to Mount Burr Road that will take you into Penola. 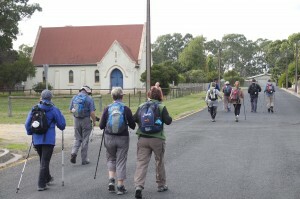 Well done you have finished the Aussie Camino! Come again soon and bring a friend! !